CENTURIAN: Pakistan won toss and decided to bat in first Test against South Africa being played in Centurion. The South Africa skipper said that had he won the toss he would have batted first as well. Pakistan will look to bounce back after the setback against New Zealand in the Test series in UAE. Sarfraz Ahmed and his team, who were almost invincible in their adopted fortress, were beaten 2-1 by an inspired effort from Kane Williamson’s Black Caps. Mohammad Abbas, the spearhead of their pace battery, has been ruled out of the Boxing Day Test with a shoulder injury. Right-arm quick Hasan Ali, teenage starlet Shaheen Afridi and veteran Mohammad Amir will take up the seam bowling mantle. Yasir Shah, out of his comfort zone on the pace-friendly pitch at Centurion, will still be an integral member of the visitors’ bowling arsenal. 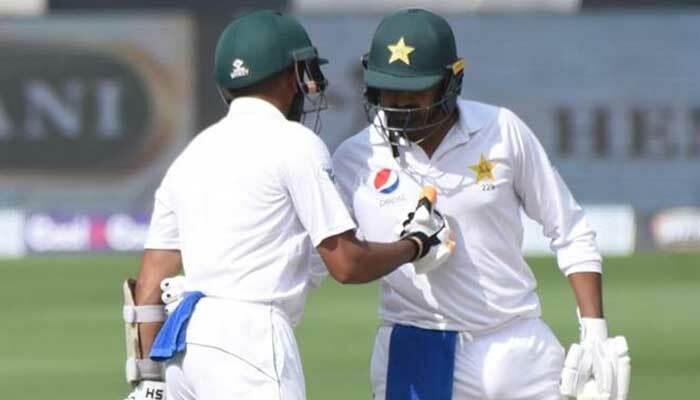 The batting unit will rely heavily on the likes of Haris Sohail, Babar Azam and Asad Shafiq, Pakistan’s leading run-scorers in Tests this year. Sarfraz’s captaincy will come under scrutiny in the testing away series, and the playing XI he chooses as well as the bowling changes he makes will be dissected. He passed his first Test on the tour, though, winning the tour game against South African Invitation XI with a six-wicket margin. South Africa, on the other hand, will be keen to grab the opportunity to ascend to No.2 in the ICC Test Team Rankings. They go into their series against Pakistan knowing that a 2-0 victory in the three Tests will help them claim the second spot on the Test rankings, going ahead of England by decimal points. Should they sweep the series 3-0 and India lose their remaining two Tests against Australia, South Africa will be just a point behind top-ranked India. Apart from the milestones the team will be vying for, there is a special individual record waiting for Dale Steyn. The pacer, with 421 Test scalps, is tied with Shaun Pollock as South Africa’s leading wicket-taker in Tests. Recurrent injuries and prolonged hiatuses have kept him on the fringes of the sport over the last three seasons, and the long-awaited record has turned into a bogey. With Vernon Philander and Lungi Ngidi out with injury, Steyn will be at the forefront of the Proteas pace battery. The experienced campaigner will be gunning to reach the magical figure, to reaffirm his position as one of the greatest cricketers produced by South Africa. Kagiso Rabada, No.1 on the ICC Test Rankings for Bowling, will spearhead the home attack alongside Steyn. The seamer, with his pace, will be the most difficult-to-parry bowler for the visiting batsmen. Hashim Amla, Quinton de Kock and Dean Elgar, along with skipper Faf du Plessis, bring experience and solidarity to the South African batting line-up. Newcomer Theunis de Bruyn, who had a fruitful tour of Sri Lanka, will be keen to follow up on his hundred in Asia with a strong performance at home. Underperforming batters like Aiden Markram and Temba Bavuma will also look to regain their form in conducive conditions. While the temperature in Centurion is expected to remain warm in the first two days, the forecast suggests thunderstorms on the three remaining days of the Test.